Colourful, lively illustrations accompany this dual-language Swahili and English edition of Nita Goes to Hospital. Nita is knocked down by a car and breaks her leg. She is taken to hospital where she is very brave. The doctors and nurses look after her and help her to walk on crutches until her leg mends. Find out what happens during Nita's stay in hospital and how the doctors and nurses make her better. 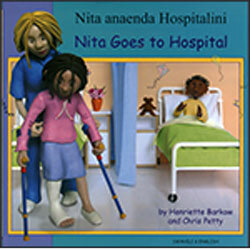 Nita Goes to Hospital Swahili / English is a high-quality bilingual picture book, suitable both for children who are learning and reading Swahili and English in parallel and those being introduced to Swahili or English as a second language.